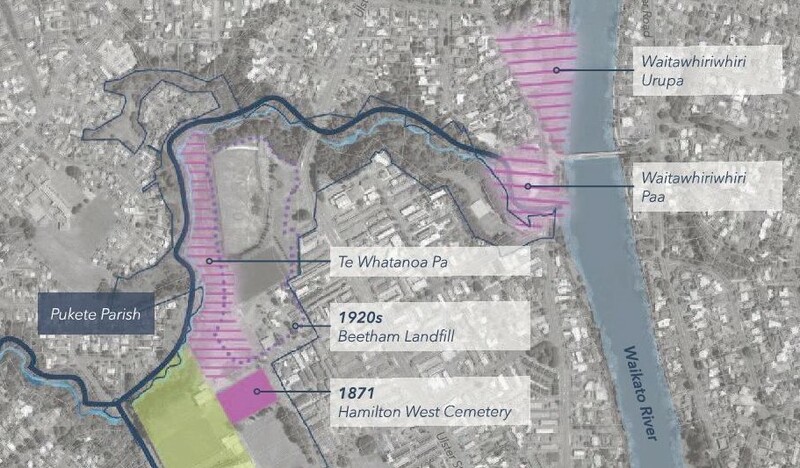 Waitawhiriwhiri Pa – ‘The pa, which Maori records confirm was called Waitawhiriwhiri, was sited in the vicinity of Kotahi Avenue (some 200 metres south of Milne Park).’* The 2019 West Town Belt master-plan draft revA, shows this above the Waitawhiriwhiri Stream outlet, north side. The 1988 Draft ‘West Town Belt management plan’ included the above concept Plan, which shows that in the last 30 years none of what was proposed and possible has been done. The gradient of the path entering Egdecumbe Park from Uster St is deadly. The path entrance needs to be moved north to start below the rise, where there is a desire line path into the gully. From this starting point a new shared-use path should be built with a gradient of an accessible standard. Sight lines into Edgecumbe Park from the corner of Victoria and Edgecumbe Streets need improving, so should ‘dodgy’ activity happen in this park it is not being hidden. Back to Concept 1: ‘Possible future pedestrian underpass combined with the Waitawhiriwhiri stream pipe to link the WTB walkway with the river-walk system’ – this does sound like a practical idea.